Development is moving Reston forward, with new residential, office and retail going up all around Reston Parkway and Old Reston Avenue. One plot remains the same — and empty. 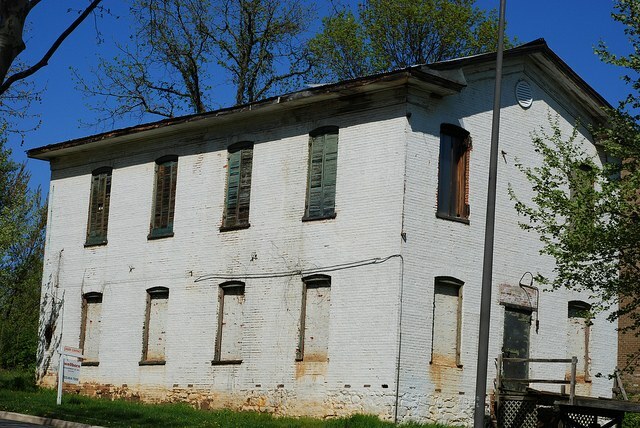 The 126-year-old Bowman Distillery has been empty for at least 20 years. The distillery, formerly home to where they used to make Virginia Gentleman whiskey, has been on the National Register of Historic Places since 1999. That means it can’t be torn down to make way for condos, offices or the other type of development happening around Reston. The white brick building could, however, be repurposed into something else. A museum? A Bed and Breakfast? In addition to being a distillery, the building served long ago as the Wiehle Town Hall and a church. The distillery has gone through several rezoning applications over the years. In 1989, after Bowman Distillery moved operations to Fredericksburg, the building was rezoned as part of a larger mixed-use development. Some of that development happened on parts of the original 32-acre property, but the historic building remains untouched. In 1998, it was sold to an owner who planned to build a Bed and Breakfast or condo. It sold again in 2010 for $540,000. With its historic bones and close proximity to the W & OD Trail and Reston Town Center, surely someone has a vision for the property. What is yours? Tell us in the comments.